Champion Safe Gun Safes offer customers the best value on the market. From our premier Crown Series gun safes to our sturdy Model T Gun Safe Series, each gun safe is built to outperform its closest competitor in price and quality. In today’s marketplace, not all gun safes are built equal. The security offered by cheap, lightweight gun safes is often little more than illusion. Deceptive-looking gun safes lull many buyers into a false sense of security. Remember in the old movies how the bank robbers used dynamite to blow up safes? Those were heavy, tough safes – too tough to break into using conventional tools. Unfortunately, dynamite is no longer needed to enter many of today’s lightweight home safes – all a thief needs is a couple of large screwdrivers. Champion still builds gun safes the old way: heavy and tough! Our gun safes are built up to a standard, not down to a price. 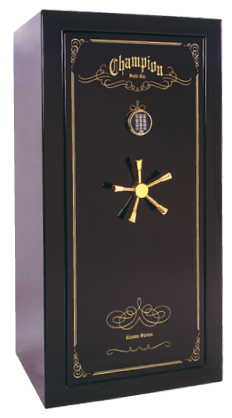 In fact, our gun safes are the heaviest, strongest, toughest safes on the market.